With social media sites being used by ⅓ of the entire world, they’ve clearly had an major influence on society. But what about our bodies? 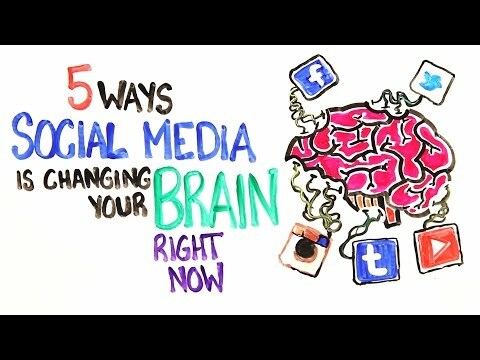 Here are 5 crazy ways that social media and the internet are affecting your brain right now! Can’t log off? Surprisingly, 5-10% of internet users are actually unable to control how much time they spend online. Though it’s a psychological addiction as opposed to a substance addiction, brain scans of these people actually show a similar impairment of regions that those with drug dependence have. Specifically, there is a clear degradation of white matter in the regions that control emotional processing, attention and decision making. Because social media provides immediate rewards with very little effort required, your brain begin to rewire itself, making you desire these stimulations. And you begin to crave more of this neurological excitement after each interaction. Sounds a little like a drug, right? We also see a shift when looking at multi-tasking. You might think that those who use social media or constantly switch between work and websites are better at multitasking, but studies have found that when comparing heavy media users to others, they perform much worse during task switching tests. Increased multi-tasking online reduces your brains ability to filter out interferences, and can even make it harder for your brain to commit information to memory. Like when your phone buzzes in the middle of productive work. Or wait…did it even buzz? Phantom Vibration Syndrome is a relatively new psychological phenomenon where you think you felt your phone go off, but it didn’t. In one study, 89% of test subjects said they experienced this at least once every two weeks. It would seem that our brains now perceive an itch as an actual vibration from our phone. As crazy as it seems, technology has begun to rewire our nervous systems – and our brains are being triggered in a way they never have been before in history. Social Media also triggers a release of dopamine – the feel good chemical. Using MRI scans, scientist found that the reward centres in people’s brains are much more active when they are talking about their own views, as opposed to listening to others. Not so surprising – we all love talking about ourselves right? But it turns out that while 30-40% of face-to-face conversations involve communicating our own experiences, around 80% of social media communication is self involved. The same part of your brain related to orgasms, motivation and love are stimulated by your social media use – and even more so when you know you have an audience. Our body is physiologically rewarding us for talking about ourselves online! But it’s not all so self involved. In fact, studies on relationships have found that partners tend to like each other more if they meet for the first time online rather than with a face to face interaction. Whether it’s because people are more anonymous or perhaps more clear about their future goals, there is a statistical increase in successful partnerships that started online. So while the internet has changed our verbal communication with increased physical separation, perhaps the ones that matter most end up even closer. Speaking of social media, we had you ask us questions on twitter, instagram, facebook, tumblr, google+ and every other social platform we could find and did a Q&A Video over on AsapTHOUGHT! So if you feel getting some insider info on AsapSCIENCE and behind the scenes, check it out with the link in the description! Got a burning question you want answered? Ask it in the comments or on Facebook and Twitter. We also finally got a PO Box, for all of you amazing science lovers who have requested to send us mail or other stuff over the years. And we’d love to hear from all of you! So feel free use the address on the screen or in the description box. And subscribe for more weekly science videos! . Sign Up For Our Newsletter And Receive Incredible Social Media Tips & Tricks!